When your baby is diagnosed with what is known as hip dysplasia, the delayed development of the hip joint socket, your doctor will talk to you about suitable treatment methods and the duration of therapy. The Tübingen hip flexion and abduction orthosis according to Professor Dr. Bernau establishes the best possible conditions to ensure that your child's hip matures completely with no problems. The hip position which most favours development is known as the "seated squat position". It is the same position which the child assumes in the womb before birth. The splint flexes the infant's hip joint at an angle in excess of 90 degrees and spreads them slightly. Even if this appears unusual at first, it is just an extension of the pre-birth phase. This allows your baby's hips to mature under the same favourable conditions as they would in the womb. 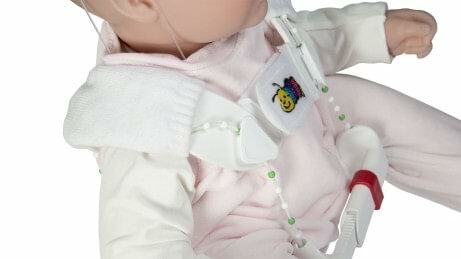 The shoulder harness with comfortable padding is easy to put on using the hook-and-loop closure. The orthosis is easy to put on and take off. The red closures are not adjusted by you, but exclusively by your doctor or the authorised orthopaedic technician. The child's hip is positioned in the desired spread-squat position using the spreader bar and the combination of the thigh shell with the shoulder harness. This allows the hip joint to mature. The beaded cords are colour-coded. This is for orientation so that you can easily find the settings again once they have been established. Naturally you want your child to be able to move and kick normally. Your child should get to know its body and discover the world with curiosity. The Tübingen hip flexion and abduction orthosis does not limit your child's freedom of movement. Its general motor development, for example when it learns to turn its body, is not delayed compared to other children. Nature is the best guide for the treatment of hip dysplasia. The spread-squat position with bent legs, which is how your baby is positioned with the Tübingen hip flexion and abduction orthosis, is a natural body posture which your baby also assumes in the womb. In this position, your child's hip can therefore mature under the same favourable conditions as it would in the womb. Your doctor fits the Tübingen hip flexion and abduction orthosis and explains to you exactly how to handle the orthosis. Within a very short period of time, you will be well versed in putting the splint on and taking it off because you only have to use the Velcro closure and the white closures. Many parents worry that their child will not feel comfortable with the orthosis. However, you will see how quickly your child becomes accustomed to it. Your child will no longer even notice it after a brief familiarisation period. Soft pads and fleecy hook-and-loop material make it comfortable as well. Should your baby fight the orthosis for a long time, it should of course be checked by your doctor. The Tübingen hip flexion and abduction orthosis has been in use for 25 years. In Germany, doctors use this orthosis most frequently by far, with very high and proven effectiveness. More than 250,000 infants have been successfully treated with it to date. Sleeping, taking a car ride in the Maxi Cosi or child seat, lying in the baby seat or attending baby swimming at the pool: Your child can wear the orthosis without problems for all of these activities. It is designed so that you do not have to remove it. Congenital hip dysplasia refers to the delayed development of the hip joint socket. Bone development of the hip joint socket is incomplete or the socket is too shallow, which means support for the joint head of the thigh bone is insufficient. Permanent damage may occur if the hip does not fully mature. Hip dysplasia can be caused by insufficient space in the womb, a shortage of amniotic fluid or a breech position. Once it is diagnosed, the following principle applies: The earlier therapy begins the better. This is because the optimum anatomical development of the hip joint is most readily influenced in the first few weeks of life. Regular examinations of the hip joints are therefore mandatory in Germany for the routine consultations U1 through U10. Hip development can be clearly defined and evaluated by means of an ultrasound. Congenital hip dysplasia occurs worldwide. Between 4 and 5 percent of newborns in Germany are believed to be affected. This means that around 25,000 to 30,000 infants per year are born with hip dysplasia. Girls are affected 5 to 7 times as often as boys. An ultrasound examination of the hips (also called sonography) is used to determine the state of hip development or maturity. Doctors in Germany use the Tübingen hip flexion and abduction orthosis for the treatment of hip dysplasia far more than any other. It has already proven itself in practice and therapy for more than 25 years. 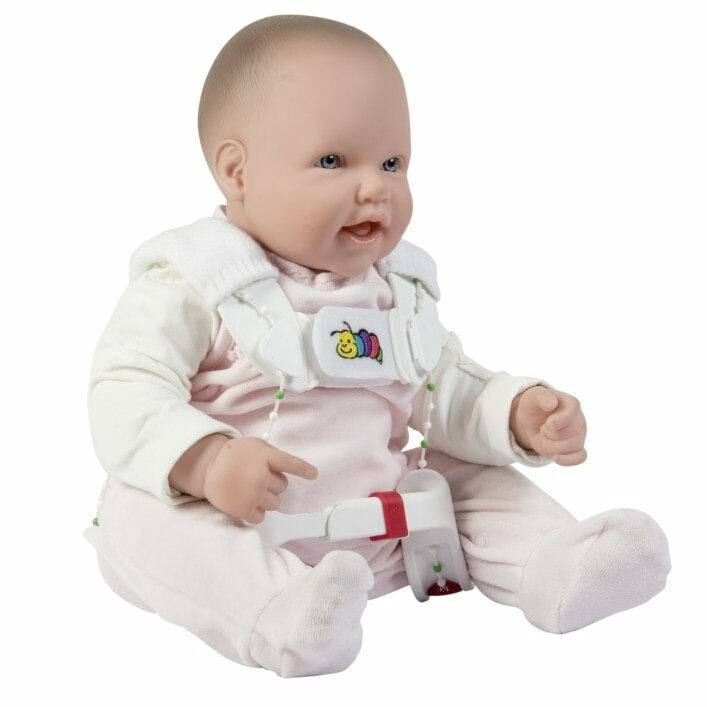 With the Tübingen hip flexion and abduction orthosis, your baby's hips are flexed at more than 90° while the legs are spread (abducted) by 30 to 45°. The duration and course of treatment are determined by your doctor. Depending on the age and maturity level, the orthosis is worn for 12 to 16 weeks. Regular ultrasound examinations (every 3 to 4 weeks) are used to monitor and ensure positive hip development. This allows your doctor to determine whether and when the orthosis needs to be readjusted. Once your child's hip has reached normal values, the daily duration of use is reduced – usually after 6 to 8 weeks. At this point, your baby usually has to wear the orthosis only at night for a period of 12 hours. An X-ray is taken in a final examination and a comparative examination should be conducted in every case one year later. The information tells parents how to put on the orthosis. Important elements of the orthosis are illustrated in a poster format and the individual application steps are shown. Useful tips and care instructions are provided as well. Is ultrasonic scanning harmful for my baby? Ultrasonic scanning does not involve the use of radiation, is entirely painless and constitutes the standard examination method today. Does my baby have to wear the orthosis all day and all night? Normally, the hip flexion and abduction orthosis should be worn day and night – that is, for about 23 hours a day (except when changing and bathing). Does it take long for my baby to get used to the orthosis? Most babies get used to the new situation very quickly (1 or 2 days). Some babies do protest and need more time. Should your baby fight the orthosis for a long time, talk to your doctor and have the orthosis checked. Is it bad for the back when my baby is constantly in this position? Quite the contrary. Kicking generally strengthens the back musculature. 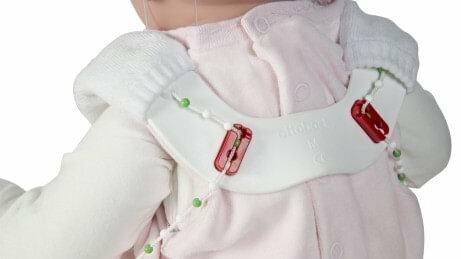 In fact, babies develop a stronger back compared to their peers who have not worn an orthosis. Can I transport my child in a car seat with the orthosis? Yes, this is no problem with modern child seats. Just be sure that the belt is below the spreader bar. Can my baby also sleep lying on its side with the orthosis? Yes, with a pillow behind it your baby can easily lie diagonally on its side. Can I also pick up my baby with the orthosis? You can hold your baby just like you normally would. There is nothing special to be aware of when cuddling or in any other situation. It is important for you as the parent to know that the Tübingen hip flexion and abduction orthosis is not unpleasant for your baby and is for the best. Can the Tübingen hip flexion and abduction orthosis also be used in water? Direct use in water is no problem thanks to the chosen plastic material and it can be easily dried using a dry cloth. The terry cloth covers and hook-and-loop closures are also designed for contact with water, but have to air dry as well. How can I clean the orthosis? The hip flexion orthosis itself is washable. You can easily remove and wash the terry cloth covers of the shoulder harness. A pair of terry cloth covers and replacement hook-and-loop are included in the package.